Bedrooms: 3 "3rd bedroom has no closet"
Great location in Manor Park, Dartmouth; Walking distance to shopping, public transit and Brownlow Park. 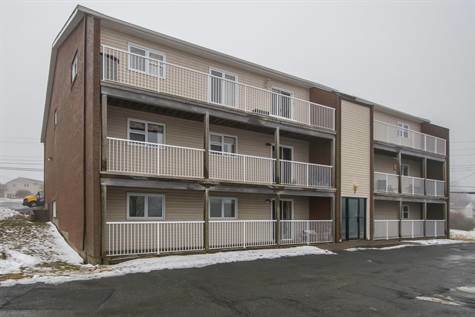 This main floor, 1 level condo has 1112 sq.ft of living space, 1 bath, 2 bedrooms, plus a large master with walk-in closet. (3rd bedroom has lots of windows, but no closet so could be used as den or office). This property has had some modifications for easier access for persons with mobility issues, such as ramp on balcony, cupboards with slide out drawers, and wheelchair width doorways. Also has a 9x11 storage room and separate 5x7 utility/laundry room. Condo fees of $250/month includes 3x3 storage and parking space. Includes fridge, stove, and dishwasher. Electric baseboard heat, with utilities app. $250/month. Condo faces and is steps away from Brownlow park.